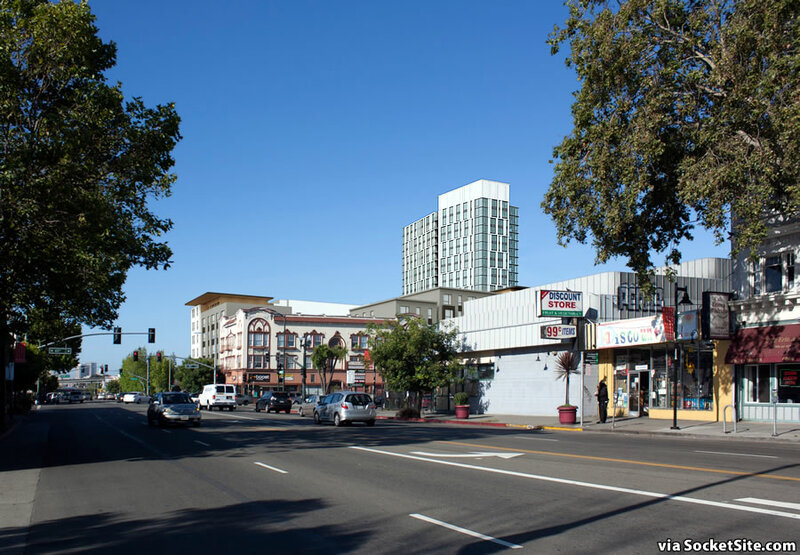 The refined designs for a 25-story tower to rise up to 260 feet in height at 532 Turquoise Street, across from the MacArthur BART Station in North Oakland, will be presented to Oakland’s Planning Commission on January 18. As designed by Solomon Cordwell Buenz (SCB) for Boston Properties, the proposed MacArthur Transit Village “Parcel B” tower includes 402 apartments, of which 45 would be offered at below market rates, over a podium garage for 260 cars and 10,000 square feet of ground floor retail/restaurant space. 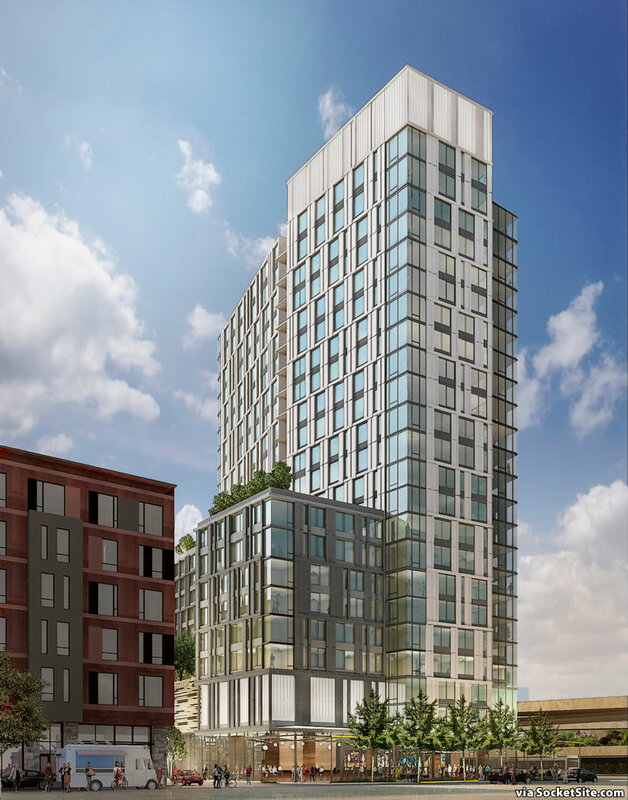 Originally approved for an 80-foot-tall building with 150 apartments to rise on the Parcel B site, which is principally zoned for development up to 90 feet in height, Boston Properties supersized the proposed project shortly after being approved as the new development partner for the parcel this past summer. If Oakland’s Planning Commission recommends amending the MacArthur Transit Village’s Master Plan to allow for the increased height, which the City’s Planning Department is recommending it does, it will then be up to Oakland’s City Council to give the final okay for the supersized project. While I’m a YIMBY, I have mixed feelings about a tower that’s approximately 5x the height of its tallest neighbor. This development reminds me of Emeryville’s Pacific Park Plaza and how out-of-whack Pacific Park is with its immediate surroundings. But we do need the units. And it is on BART. Someone’s gotta be the first. This is a BART transfer station, perfect place for a few buildings of this size. Pacific Park Plaza was and still is a landmark. What’s wrong with having a visual reference? My God, let the urban environment evolve at its own pace. Build this please!!! I knew this was on the table in the mcarthur transit plan!!!!! Density and urban feel is perfect for this in this area. Is “While I’m a YIMBY…” the new “I know we need housing, but…”? I feel like it’s pretty central to the YIMBY attitude that the need for housing, especially dense housing near transit, is more important than “omg the building is going to be a different height than other buildings.” Can you really identify as a YIMBY if you don’t agree with that? I dunno. But, that said, it rules that you like the YIMBY movement enough to want to associate with it. Hope you decide to become a supporter! With that statement, you sound like a NIMBY. 5x the height of the BART parking garage? 5x the height of the freeway? That’s the context. There are no quaint little bungalows anywhere near this proposed project. Even the early 20th century homes close by are large and tall. There should be a mini-city around each and every BART station in the Bay Area -that’s how the rest of the world does transit and it works. YIMBY. While it does seem out of context at first, it will be right next to the freeway and the BART parking structure will be on one of its other sides. I can overlook any of my own tastes and preferences for what my neighborhood looks like if it means more housing on a spot that doesn’t directly displace anyone. We need to take advantage of old commercial buildings where people don’t live and empty lots like this one if we want to avoid direct displacement and allow those with the funds to live here. Cause they already do, and they win against every other person with a lower income vying for the same apartment/home. My first impression too, but the fact that it sits back from the street, in the middle of the (former) BART parking lot & directly abutting the freeway, means that the height won’t be directly looming over much other than the BART parking garage. (ok, the other housing built on the site too…) If it were right on Telegraph it would read very differently, but I think it will be OK as it is. An exclamation mark proclaiming the MacArthur BART station. Woo hoo! A few more towers of that size, and it won’t look out of place at all. I would think the issue of context would – or maybe “should” – be more in the sense of how it fits with the surrounding streets, casts shadows, burdens schools, etc. If so, under the first criteria, it will be an excellent fit, since it’s surrounded by 4-lane streets on three sides and an 8+lane freeway on the fourth (though, admittedly, the freeway has no access at this point). And excellent under the second as well since there’s little but parking lots and train platforms around it. In the 70’s there were a number of tallish (~12-15 story) buildings built in the Piedmont Ave/Kaiser Hospital area – including, of course, Kaiser itself – which caused controversy precisely b/c they failed under one/both of the first two criteria, but that shouldn’t be the case here. The resistance: Coalition for Appropriate Development. When your resistance amounts to refusing the construction of homes for oakland’s ever increasing population, you’re the one to blame for gentrification and displacement. I don’t have a facebook account so maybe I can’t access all the content on their site. However I see nothing on their site outlining why they’re opposed to the project. Am I missing something? Our surrounding neighborhood consists of a mix of single family homes and 2-4 story apartment buildings. The city must conduct an entirely new Environmental Impact Report and prove CEQA compliance. DEMAND NEW DEVELOPMENT BE APPROPRIATE TO THE SCALE OF OUR NEIGHBORHOOD. A COMMUNITY DOES NOT FLOURISH IN THE SHADOWS OF A TOWER. “Coalition for Appropriate Development”aka please continue to limit the amount of housing next to a major transit hub so that my property values continue to soar. communities thrive in neighborhoods with large apartment buildings all over the world. don’t worry you’ll still be able to flip your house for double or triple what you paid for it. For the past 50+ years, the MarArthur BART station has been bejeweled by an enormous sunken parking lot that was a magnet for garbage, weeds, and thieves. As eyesore parking lots go, this one was truly outstanding. Where was the “Coalition for Appropriate Development” for the past several generations, while we endured this blighted parking lot (where not very much community was flourishing)? In its place, we can build *housing*, which is a critical ingredient for community. Inside this tower are apartments, and inside the apartments are people, and the people are living and laughing, cooking and eating, studying and visiting…. they are in fact creating community. It seems to me that you mean to say “OUR community does not flourish….” You may have managed to snag a nice east bay craftsman bungalow, with a nice yard and a nice dog and your nice friends living around the corner. I’m sure you have a very nice community (I mean that sincerely.) But it won’t work for everyone who wants to live here, it won’t work for the future. I agree with other commenters: being set back from Telegraph, abutting a parking garage and an elevated freeway, why not go big? Notcom, the coalition is basing their argument on lies and for that reason I think they’re being horrible people. When you have to bend the truth, like showing the scale of the TOD buildings, but then adding that a *1/2 mile away* buildings are even shorter -you’re being manipulative and ridiculous. Thorn, look up “gaslighting”. Make a real argument -it will last longer. These groups have such Orwellian names. There’s nothing “appropriate” about draconian zoning near transit that pushes development out to sprawling, car-dependent suburbs instead. If they’re a coalition for appropriate development they should be strong supporters. If a 25 story building makes sense anywhere, it makes sense here. This would be good for Oakland if it gets built. 400 units of housing that do not displace anyone. Perfect use of the site. Alright, I’m convinced. Build it! The freeway behind the buildings above is roughly 45 feet in height, the adjacent BART garage is 64 feet. I was referring to the 4 levels of freeway overpasses to the south. I think that may have been what the SS editor was referring to also (the key here being “roughly): there are two levels of overpasses above 580 – which is itself above 24 (which is at grade where the two cross) – so if you figure a deck height of 3′ and 15-20′ of clearance b/w levels you have ~65’…I don’t think it’s as tall as it seems. On the main BART transfer station? On a large commercial Street? Approve it and build it. Oakland needs tax revenue. The first thing to address is the lack of affordable housing. 45 units of under-market housing and 357 units of market rate housing, which translates in this market into expensive apartments/condos, is a poor mix. Make it 150 under-market and 252 market rate and then there is a serious conversation to be had about the concession to size. Otherwise, this is too tall and disruptive to the community. Stopping construction like this–given that there was a community agreement that Boston Properties is now blatantly ignoring–does not create gentrification: gentrification is caused by job development that ignores local hires and imports workers from other communities to take these jobs and thus strain housing needs. Hire locally–there are plenty of people in Oakland willing to take these jobs if offered–and the problem eases. Meanwhile, the answer is not to take over the city and shape it only for the newcomers with money who have no loyalty to Oakland and its culture. I live in the neighborhood. I have loyalty to Oakland and its culture. I want this built. I’m sick of the cabal of rich homeowners fighting development so their property values can keep going up. Oakland isn’t your personal playground. can you define how long someone has to live in oakland before they can claim to have loyalty to oakland and its culture? 5 yrs? 25 yrs? the wonderful thing about cities is that they are always being ‘taken over’ and reshaped–so called newcomers help to drive this change and keep places from becoming stagnant. this conservative outlook that places should always remain the same always baffles me about people who otherwise claim a progressive outlook on the world. gentrification is a word tossed around so often that its lost its meaning–the real issue is displacement. the reality is that oakland population has risen by as much as 25,000 people in the last ~5 yrs, but hasn’t built enough housing accommodate the increase. the assumption is, and i’ll go with it, that these new residents have a higher rate of income and therefore can afford to pay more for housing–by not building new housing they compete with current residents driving up costs and helping to incentivize evictions. oakland needs to be building more housing–both below market rate as well as market rate. 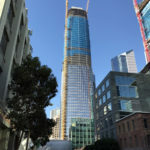 pushing back on it, forcing consessions etc causes the construction costs to soar beyond the already high $300/sq ft on average that we currently see in the east bay. Well said, more immigrants please! I’ve lived in the neighborhood for 15 years and use MacArthur station all the time. Many people against this tower would consider themselves pro-immigrant if you’re talking about into the US. Not so for California, Bay Area, Eastbay, and Temescal. Many would also consider themselves non supportive of stereotyping but then stereotype new residents as all white, tech workers. From my experience new residents represent the whole spectrum of races, cultural backgrounds, sexual orientation, and income levels. Our neighborhood has become and is becoming more diverse! The 45 units are already way more than is required by a project of this size. This could have been said in 1906, 1940, 1962 about new construction and migrants to Oakland. Scott, an auslander himself, would deny housing for Oakland newest wave of migrants and immiserate all renters and new home buyers for his own arbitrary Boomer preferences. If it has to be this tall, let’s make it as attractive as possible. Is this the final rendering for the project? I love it and want to see similar heights next to BART at 16th St Mission (my stop! ), 24th St Mission, Glen Park, Balboa Park, Daly City, Colma, South San Francisco, San Bruno and Millbrae. 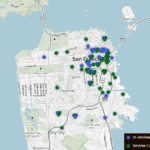 I think they pretty much all have soft sites nearby that would work, with the possible exception of Glen Park. Curious if there is a portion of affordable/low income units in this project? When article mentions “be,ow-market” units, I’m curious by how much? the article states 45 units are below market rate–i believe to qualify for a bmr unit you must make less than 120% of the current area median income–for one person that would be $81,900. here’s a current chart of oakland AMIs. below market units, of course, differ from low/very low income units which would be assisted or section 8 units. Build it and get the bus routes finalized so that the buses can get good maintenance by on site mechanic during the driver’s break and the switching off between bus drivers can go evenly more smoothly! 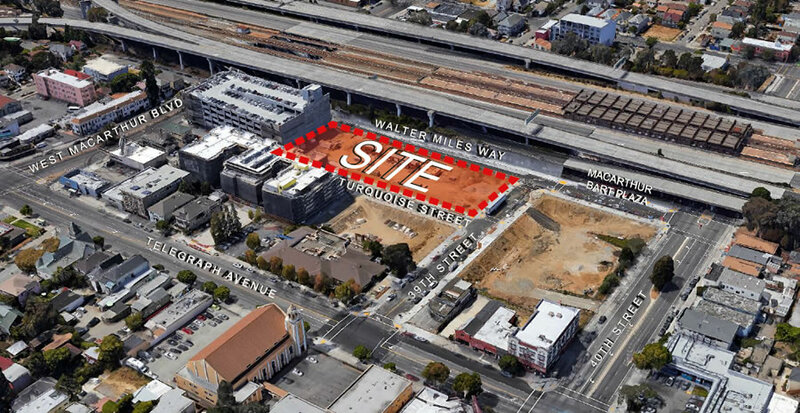 Why does high rise residential construction “pencil out” on this site, in Temescal, but not downtown right over the 12th Street/City Center BART station where empty lots are held for over a decade by San Francisco developers? if anywhere is appropriate for high rise residential it would be at 11th & Broadway or at 12th & Clay in DTO. Also anywhere near the Broadway spine around the 19th Street BART station where newer residential construction is fetching premium rents. If people are serious about wanting more appropriately scaled development then they should find some way to make that happen. There are quite a number of lots, derelict, and simply old structures in this area. We can have a tower at the train station and a vibrant community of low and midrise housing we just need to build it. Build it please, also don’t forget to upgrade the bart plaza with solar panels. I’m also a neighborhood resident and I want this project built; this is a pretty rare site where something of this scale would – and should – fit quite well into the neighborhood. I’ll see it every day when I leave my front porch, and I’m looking forward to it. UPDATE: The hearing for the proposed 25-story tower to rise on Parcel B has been pushed back to February 1, 2017.